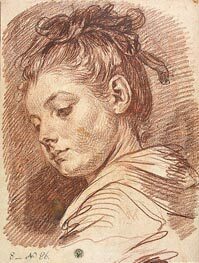 Jean-Baptiste Greuze (21 August 1725 – 4 March 1805) was a French painter. Born at Tournus, in Burgundy, he is generally said to have formed his own talent; this is, however, true only in the most limited sense, for at an early age his inclinations, though thwarted by his father, were encouraged by a Lyonnese artist named Grandon, or Grondom, who enjoyed during his lifetime considerable reputation as a portrait-painter. Grandon not only persuaded the father of Greuze to give way to his sons wishes, and permit the lad to accompany him as his pupil to Lyons, but, when at a later date he-himself left Lyons for Paris - where his son-in-law Grétry the celebrated composer enjoyed the height of favour — Grandon carried young Greuze with him. 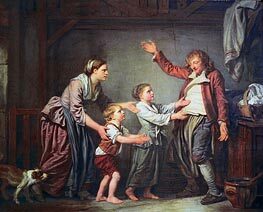 Settled in Paris, Greuze worked from the living model in the school of the Royal Academy (Paris), but did not attract the attention of his teachers; and when he produced his first picture, "Le Père de famille expliquant la Bible a ses enfants," considerable doubt was felt and shown as to his share in its production. 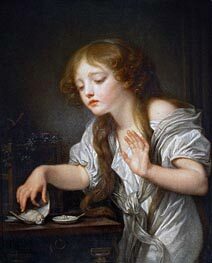 By other and more remarkable works of the same class Greuze soon established his claims beyond contest, and won for himself the notice and support of the well-known connoisseur La Live de Jully, the brother-in-law of Madame d'Epinay. 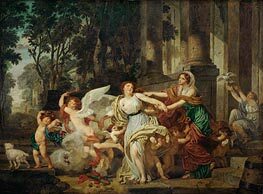 In 1755 Greuze exhibited his "Aveugle trompé," upon which, presented by Pigalle the sculptor, he was immediately agréé by the Academy. Towards the close of the same year he left France for Italy, in company with the Abbé Louis Gougenot, who had deserted from the magistrature — although he had obtained the post of conseiller au Châtelet in order to take the petit collet. 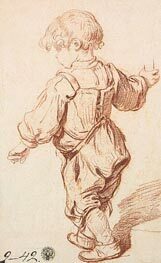 Gougenot had some acquaintance with the arts, and was highly valued by the Academicians, who, during his journey with Greuze, elected him an honorary member of their body on account of his studies in mythology and allegory; his acquirements in these respects are said to have been largely utilized by them, but to Greuze they were of doubtful advantage, and he lost rather than gained by this visit to Italy in Gougenot's company. He had undertaken it probably in order to silence those who taxed him with ignorance of great models of style, but the Italian subjects which formed the entirety of his contributions to the Salon of 1757 showed that he had been put on a false track, and he speedily returned to the source of his first inspiration. 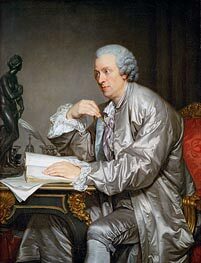 In 1759, 1761 ("L'accordée de village", Louvre), and 1763 Greuze exhibited with ever-increasing success; in 1765 he reached the zenith of his powers and reputation. 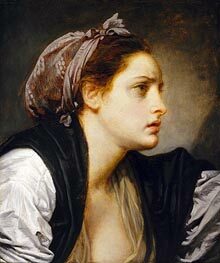 In that year he was represented with no less than thirteen works, amongst which may be cited "La Jeune Fille qui pleure son oiseau mort", "La Bonne Mère", "Le Mauvais fils puni" (Louvre) and "La Malediction paternelle" (Louvre). 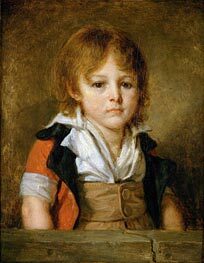 The Academy took occasion to press Greuze for his diploma picture, the execution of which had been long delayed, and forbade him to exhibit on their walls until he had complied with their regulations. 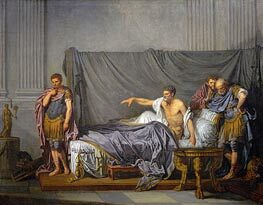 "J'ai vu la lettre," says Diderot, "qui est un modèle d'honnêteté et d'estime; j'ai vu la réponse de Greuze, qui est un modèle de vanité et d'impertinence: il fallait appuyer cela d'un chef-d'œuvre, et c'est ce que Greuze n'a pas fait." 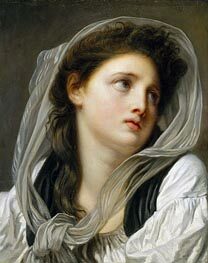 Greuze wished to be received as a historical painter, and produced a work which he intended to vindicate his right to despise his qualifications as a peintre de genre. 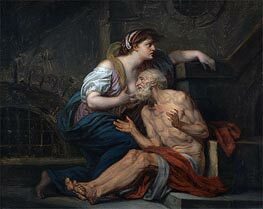 This unfortunate canvas "Sévère et Caracalla" (Louvre) was exhibited in 1769 side by side with Greuze's portrait of "Jeaurat" (Louvre) and his admirable "Petite Fille au chien noir". The Academicians received their new member with all due honours, but at the close of the ceremonies the Director addressed Greuze in these words "Monsieur, l'Académie vous a reçu, mais c'est comme peintre de genre; elle a eu égard à vos anciennes productions, qui sont excellentes, et elle a fermé les yeux sur celle-ci, qui n'est digne ni d'elle ni de vous." Greuze, greatly incensed, quarrelled with his confreres, and ceased to exhibit until, in 1804, the Revolution had thrown open the doors of the Academy to all the world. 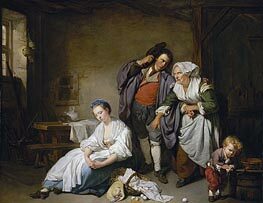 In the following year, on the 4th of March 1805, he died in the Louvre in great poverty. 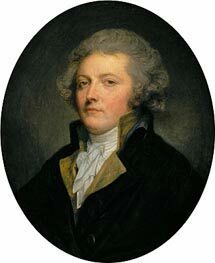 He had been in receipt of considerable wealth, which he had dissipated by extravagance and bad management, so that during his closing years he was forced even to solicit commissions which his enfeebled powers no longer enabled him to carry out with success. 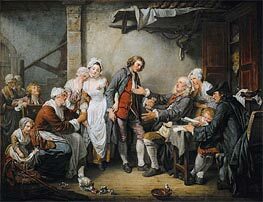 The brilliant reputation which Greuze acquired seems to have been due, not to his accomplishments as a painter for his practice, but is evidently that current in his own debut to the character of the subjects which he treated. That return to nature which inspired Rousseau's attacks upon an artificial civilization demanded expression in art. Diderot, in Le Fils naturel et le père de famille, tried to turn the vein of domestic drama to account on the stage; that which he tried and failed to do Greuze, in painting, achieved with extraordinary success, although his works, like the plays of Diderot, were affected by that very artificiality against which they protested. 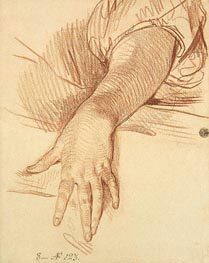 The touch of melodramatic exaggeration, however, which runs through them finds an apology in the firm and brilliant play of line, in the freshness and vigour of the flesh tints, in the enticing softness of expression, by the alluring air of health and youth, by the sensuous attractions, in short, with which Greuze invests his lessons of bourgeois morality. As Diderot said of "La Bonne mère", il a prêché à la population; and a certain piquancy of contrast is the result which never fails to obtain admirers. "La Jeune Fille à l'agneau" fetched, indeed, at the Pourtal's sale in 1865, no less than 1,000,000 francs. 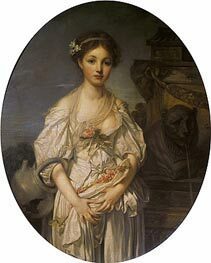 One of Greuze's pupils, Madame Le Doux, imitated with success the manner of her master; his daughter and grand-daughter, Madame de Valory, also inherited some traditions of his talent. 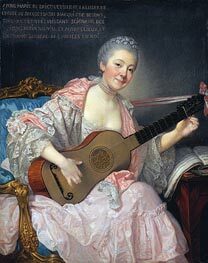 Madame de Valory published in 1813 a comédie-vaudeville, Greuze, ou l'accorde de village, to which she prefixed a notice of her grandfather's life and works, and the Salons of Diderot also contain, besides many other particulars, the story at full length of Greuze's quarrel with the Academy. 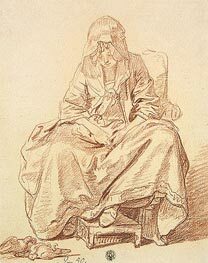 Four of the most distinguished engravers of that date, Massard père, Flipart, Gaillard and Levasseur, were specially entrusted by Greuze with the reproduction of his subjects, but there are also excellent prints by other engravers, notably by Cars and Le Bas.